Living at internet speed means you can blow away a weekend before you realize it. Last week, I decided that I would become a publisher, since the traditional routes to getting a book published were really thorny, and I would end up waiting 18 months to get my first royalties, if ever. Since I’ve been drinking this blogging Kool-Aid for a year and a half now, I have lost the proper balance of caution and prudence that should accompany the launch of new ventures. On the specious basis that rushing the barricades might be interesting, I read a few chapters of Dan Poynters excellent book on self-publishing . I didn’t read much, just enough to be convinced that self-publishing could be a good thing. The biggest problem with becoming a publisher was finding a name for the business. I spent two days looking at lists of publishers and decided that most of the lists were outdated anyway, so I googled four or five likely names and they had been picked by MILLIONS of other people! I thought, what combination of words would be catchy, unforgettable and unlikely to mean anything until I define them? Bent Crow Press was the first name that popped into my mind. I Googled it and there were no hits whatsoever. Ta Dah! We had a winner! There is no hiddden significance in the name, but it is sufficiently off-beat that it will probably generate some speculation. As long the name of the book is spelled right, I don’t mind what conclusions are drawn about the publisher. I registered the name at our local courthouse Friday, opened a bank account an hour later, designed a logo with Gretchen’s help yesterday while updating the original book and producing an e-book version for PDAs, added a gmail account thanks to Rosa Say, set up a 1800 number for Bent Crow Press today on Vonage, and kicked back for a short break before creating a Bent Crow Press website. 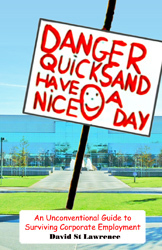 Those of you with PDAs are invited to follow David Hanna and download Danger Quicksand to your PDAs. He downloaded the original pocket-book-sized version and used Acrobat Reader for Palm OS to convert it for his Treo 600 PDA. As you will see, this free download PDA version is set up in a smaller format and should be much more readable on a small screen. I want you to feel free to beam this PDA version to anyone you wish. You might do them a favor and save them from some uncomfortable situations. Let me know your suggestions for improving this PDA version. It isn’t perfect yet, but it is useful and that is what is most important. If you have any tales to share about beaming Danger Quicksand, please share them. I want to express my great appreciation for the help provided by Rosa Say, Avi Solomon, and Marc Orchant this week. You are materially helping me to overcome obstacles. Thanks for including my anecdote in your book! I’m honored! I am intrigued by your publishing venture. How are you making any profit on “Quicksand” if you’re offering it to the public free of charge? We seem to be on similar pages with our work. My first novel, “The Whopper Strategies” is a faux corporate manual that deals with the dangers of corporate culture, among other things. I have debated self-publishing for sometime. You will have to let me know how this thing evloves. I am very curious to know. At the moment, this first novel will be out in the serial magazine, Ellipses. I have no idea where to go afterwards. It is a fun situation, isn’t it? I look forward to hearing from you. You seem a wonderful person.